The 2001 Moss Wood Cabernet Sauvignon is arguably the greatest wine yet released from the vineyard. It has a fragrant nose of mulberries, blackberries and violets with a touch of earth and some spicy, cedary notes while the palate is deep, densely flavoured with ripe cassis and mulberry, complexed by chocolate and coffee bean characters. This is a profound, powerful red, opulent and concentrated with impressive weight showing fine, ripe tannins on a long, lingering finish. The oak and densely packed fruit are seamlessly integrated. One of the best vintages in Margaret River was not without its problems. Early flowering meant that Moss Wood was subjected to the earliest bird damage ever and harvest began about 10 days ahead of schedule. The summer was mild and drier than usual and it proved to be a copybook growing season. There was a hot spell in February – five consecutive days in the high 30’s – which sent the grape sugars up. Light rains in the second week of March slowed down ripening to the benefit of the cabernet. Keith was reminded of 1991: there were no highlights during vintage and he had no great expectations at harvest, but once the wine was in the winery it looked very good indeed. 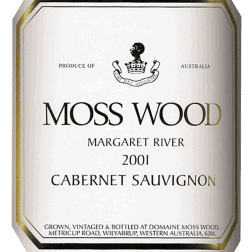 Moss Wood 2001 Cabernet Sauvignon – eRobertParker Wine Advocate #155 Oct 2004 – Robert M. Parker, Jr. This wine is built for the long haul and, if well cellared, will improve over the next ten years and remain at its peak long after that.